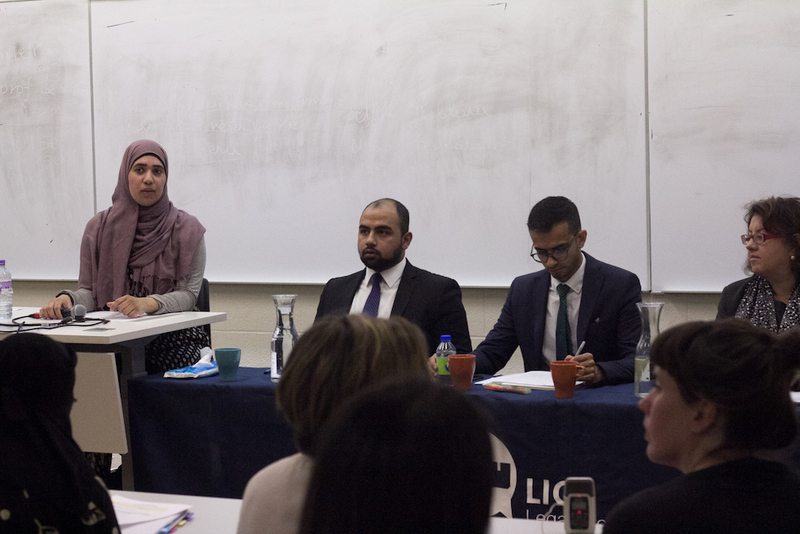 Human rights lawyer Pearl Eliadis was about to leave a panel discussion on Bill 62 organized by the Concordia Student Union (CSU) early because of an obligation when she asked the panel moderator for the microphone one last time. “When this bill was debated two years ago, where were all you guys?” she asked. Eliadis’s comments came after an attendee asked how protesters of the bill could have been more proactive. Eliadis—an adjunct professor of McGill University’s faculty of law—answered mostly judicial-related questions in the small Hall building classroom where the CSU invited guests for the panel discussion on Nov. 1. Throughout the discussion, but also immediately following her question to the attendees, Eliadis urged the public to thoroughly read and study Bill 62. The section—named “services with face uncovered”—has been the most controversial part since the bill passed on Oct. 18. Two days after the law passed, multiple people descended on Montreal’s Park Avenue and in the metro system wearing ski masks to protest against the bill. The panel’s organizers invited Fatima Ahmad, a McGill student who wears the niqab, to share her thoughts on the new bill and talk about her experience wearing the full face veil. Ironically, Eliadis noted, the provincial government launched an inquiry into systemic racism in Quebec in September, just a few weeks before Bill 62 passed. “Right hand and left hand, really,” she said, referring to the disconnect within Quebec’s government. According to Eliadis, section three of the bill, pertaining to reasonable accommodation, is just as important if not more than the ban on covered faces when using public services. “It really is ‘anything goes,’” Eliadis said, referring to the provision’s vagueness. Zuberi, a former CSU executive who also ran as a councillor under the Projet Montréal banner in 2013, encouraged the panel’s attendees to get involved in the political process. “[It’s] because people like us are not involved in those conversations that legislations like this actually pass,” Zuberi said. The CSU—which already motioned to condemn the bill during a special council meeting on Oct. 19—was supported by the Students’ Society of McGill University (SSMU) vice president of external affairs, Connor Spencer, and Association pour la voix étudiante au Québec (AVEQ) secretary general Rami Yahia at the panel. Spencer said the bill should be “called for what it is: racist and sexist”. “We do need to take a position on this. We’re students, but we’re also members of society,” he added. “[It’s] not this piece of legislation that’s problematic, it’s the societal conversation that we’re having around this legislation that’s so damaging,” Zuberi argued. According to Zuberi, company boards of directors and elected bodies in Montreal should also represent the city’s demographic by having the same percentage of visible minorities as in the society itself. Issa supported Zuberi’s idea, adding that more representation from minority groups at the National Assembly could, at the very least, bring more opposition to legislation like Bill 62.